Flat irons are a popular, simple and effective way to achieve sleek, smooth and straight hair. While there are dozens of flat irons on the market, choosing the right product for your hair type is essential to keeping your hair healthy. To help you make the right decision and choose a product best for your specific needs, our team did extensive research to find the best flat iron for natural, thick, curly and fine hair. For each product, we provide information regarding its key features, specification and other considerations. If you don’t know what type of heat plates to purchase, the ideal temperature setting for your hair type and other factors to consider, check out our buying guide below. Read more about our methodology. The Lanxim Professional is a versatile, powerful and easy-to-use flat iron. 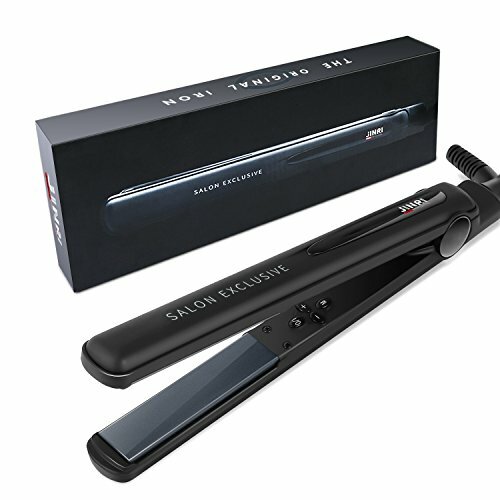 We recommend it as one of the best flat irons available due to its double floating plates, wide temperature range, fast heat up and money-back guarantee. If you desire a fast and easy way to achieve straight and smooth hair, this device is for you. Its pearl-ceramic heat plates make it ideal for all hair types, and its LCD display, audible feedback and swivel cord add to the convenience of this hair tool. If you want beautiful, smooth hair without paying a salon-price, this flat iron is an excellent option no matter your hair type. 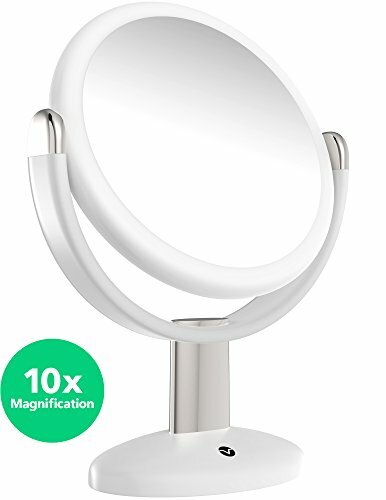 It boasts a rounded edge, making it perfect for both straightening and curling hair and its safety lock feature keeps unsuspecting hands from unwanted burns. Prevent dry and brittle hair with this flat iron. Boasting ceramic 3D plates, and ionic moisturizing, you can prevent damaging and drying out hair even after extensive use. Maintain moisture in your hair with this MHU Hair Flat Iron. The keratin-infused heat plates prevent drying out your hair and the wide temperature settings and 1.25-inch heat plates are ideal for thick or thin hair. Straighten large sections of hair easily and quickly with this KIPOZI flat iron. High 450-degree temperatures, 1.75-inch heat plates and a durable handle make it easy to smooth even the thickest and coarsest hair. Enjoy plenty of versatility and freedom with this ISHAKO Flat Iron. Boasting 1.25-inch heat plates, this flat iron is ideal for users with long and short hair and can both curl and straighten hair with ease. The PARWIN PRO is durable and versatile enough for users with fine, thin and short hair. We recommend this product as the best flat iron for thin and fine hair due to its low temperatures, 3D narrow plates and durable design. There are three popular heat plates: ceramic, tourmaline and titanium. Ceramic heat plates are the most popular and do best for fine, thin and natural hair types. This type of plate conducts heat well and helps control hair frizz. Tourmaline plates emit negative ions, which help reduce frizz and static in hair. Using this type of flat iron results in smooth and soft hair. Tourmaline plates are great for most hair types, particularly if your hair is damaged, but they are more expensive than ceramic plates. Titanium plates heat up quickly so you have little wait time. However, they can become extremely hot, which is ideal for thick and curly hair that can handle excess heat, but fine and thin hair should stay away. Look for flat irons that boast floating plates — particularly two floating plates. Floating plates describe when the heat plates are not fixed on the iron, meaning they can adjust and slightly move. This flexibility allows the plates to better grip and straighten your hair. This is particularly beneficial for reaching hair close to the crown of your head. Be wary of products with just one floating plate as they tend to pull and tug on hair while straightening. Your hair type will determine the temperature range you should consider on your flat iron. Thick and coarse hair requires a flat iron that can reach high temperatures. Many products for this hair type have a maximum temperature of 450 degrees. Damaged, dry, thin and fine hair want low heat settings to prevent any further damage to the hair. If your hair type falls into this category, you want to look for products with low minimum temperatures — generally 350 degrees or lower. Additionally, products with LED display screens will show you the exact temperature of the flat iron. This helps you maintain a steady temperature and avoid high heats. Flat irons come in a wide range of plate sizes. Many popular items feature 1-inch wide plates, while others are greater than 1.5-inches wide. Wide plates are ideal for thick, curly and long hair as it allows you to straighten more hair at once. Narrow plates are best for short hair and for reaching those pesky hairs close to the head. Flat irons vary greatly in price. Products under $30 often contain ceramic-coated metal plates. You need to look carefully at the type of plates and materials on these products as coated plates typically don’t hold heat well, have short life spans and are low quality. Flat irons $30-$100 are ideal for home use. You can find products with floating plates, ceramic, tourmaline and titanium materials and many advanced features such as automatic shut off, 360-degree swivel cords and temperature control options. Flat irons greater than $100 are professional items and made for salon use. These products can withstand extensive use and can heat up quickly — usually under 30 seconds. They have much longer life spans and do an excellent job smoothing hair and controlling frizz. The Lanxim Professional is ideal no matter your hair type. When using this flat iron, you can choose temperatures ranging between 270 degrees to 450 degrees, which gives you plenty of heat to straighten and smooth your specific hair type. The Lanxim Professional boasts double floating plates, which grips your hair without snagging it. Even more, nano silver, argan oil, ceramic and tourmaline plates ensure your hair is healthy, smooth and silky after every use. Continual temperature regulation. This flat iron uses a micro-processor chip that regulates temperature and prevents hot spots from burning and damaging your hair. 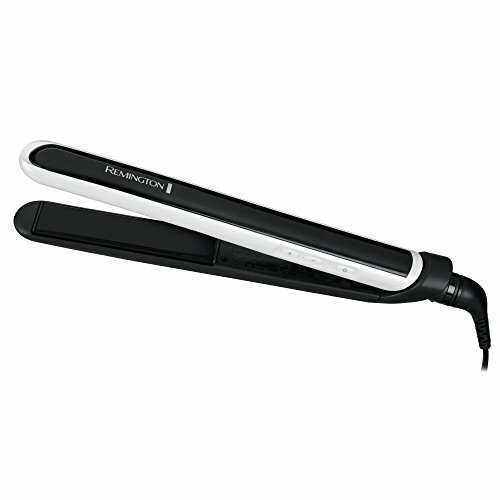 Its built-in heat sensor automatically checks the temperature of the flat iron 30 times per second. For even more precaution, an LED display constantly shows you the temperature of the device. Less pulling and tugging. The double plates on this device mean the plates can achieve a close grip on your hair. Several users report this flat iron tugs and pulls much less than similar products, which is a great benefit for those with tender heads. Doesn’t strip hair of moisture and nutrients. The floating plates boast argan oil, nano silver, tourmaline and ceramic, which work together to keep hair soft, silky and shiny. The nutrients in the nano silver help eliminate bacteria from the device, while the argan oil helps promote hair growth and retains moisture in your hair. Fast heat up times. Many users praise this device and its ability to heat up and reach lower temperatures within 15 seconds. 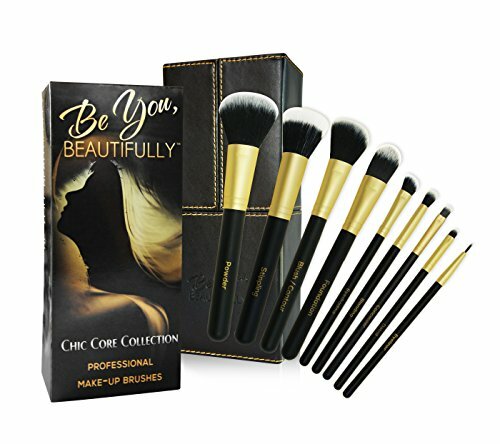 Many comparable products require a minimum of 30 to 60 seconds before there is enough heat to utilize the hair tool. Not ideal for curly and wavy hair. Many users with curly and wavy hair say they have to repeat sections of hair multiple times to achieve a smooth, straight look — even at the flat iron's highest temperature setting. The Remington S9500PP Pearl Pro Ceramic Flat Iron is gentle enough for damaged, thin and fine hair, yet powerful enough to straighten even the curliest hair. It boasts pearl-ceramic floating plates, which helps smooth hair and eliminates frizz on all hair types. Its 1-inch wide plates, along with its floating plate design, is excellent for short hair and for smoothing hair close to your head. 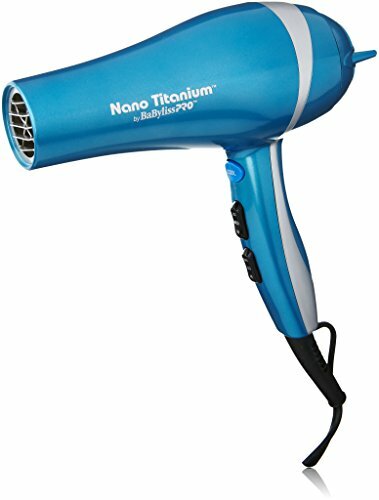 Even more, an audible beep will alert you when the flat iron reaches your desired temperature and it comes with a 3-year warranty. Powerful pearl-ceramic plates. This flat iron boasts ceramic plates infused with pearl. The combination of the two elements helps reduce frizz and gives you a more smooth, healthy appearance. It also helps reduce damage to your hair if continually using high heat. Wide temperature settings. Many reviewers say this product straightens hair as well as expensive salon-products and doesn't damage hair. This flat iron features a wide temperature range between 300 degrees to 450 degrees. Furthermore, you can view the desired temperature on the LCD display located on the front of this hair tool. Unique audible feedback. Once heated, the flat iron will beep. This is a rare feature on this type of device as many similar products provide very little — if any — indication that the flat iron has reached the desired temperature. Long three-year warranty. If you run into any problems with this flat iron, it is covered under a three-year warranty. This is one of the longest warranties available for a flat iron within this price range. Many comparable products are covered for one year or less. Exterior can become extremely hot. If the product is left on for an extended period of time, the exterior of the flat iron— particularly near the heat plates — can become extremely hot and burn users. For most hair types, the SHINE HAI Nano-Titanium Hair Straightener provides the features, capabilities and safety options you need in a quality flat iron without hurting your bank account. With 1-inch rounded edge plates, you can easily curl and straighten your hair. It also boasts a wide temperature range from 250 degrees to 450 degrees, allowing you to choose the right temperature setting for your hair type. Furthermore, a safety lock and automatic shut-off capabilities prevent this device from being left on and users from burning themselves. Temperature settings ideal for all hair types. With a temperature range between 250 degrees to 450 degrees, users with fine and thin hair can enjoy low temperatures while curly and thick hair users can experience high heat necessary to fully straighten hair. Users with thick and wavy hair in particular report this flat iron does an excellent job straightening hair and you do not have to go over each section multiple times. Curl or straighten hair with ease. The flat iron boasts rounded edges, which many users says helps this device smooth hair or make loose curls. Depending on your hair thickness and type, you may not need an additional curling iron if you want to curl your hair. Keeps users safe. A safety lock closes the heat blades so they are inaccessible and unable to burn users. Additionally, this device will automatically shut off after 60 minutes of non-use to prevent overheating, burns or fires. Great option for short hair. The 1-inch heat plates are the ideal width for short hair — such as users with pixie cuts, bobs and bangs. The narrow design of the plates makes it easy to grab hair close to your head. May take extra time to achieve straight hair. Many users say they must straighten hair multiple times to achieve a smooth appearance. This extra effort is particularly noticeable in curly, wavy and thick hair types. The BESTOPE Flat Iron is an excellent option for all hair types, but particularly dry and damaged hair. It boasts ionic heat to straighten hair and keep moisture trapped inside, instead of stripping it and causing dry, brittle hair. It features 10 pre-set temperature settings and heats up to 360 degrees within 60 seconds. 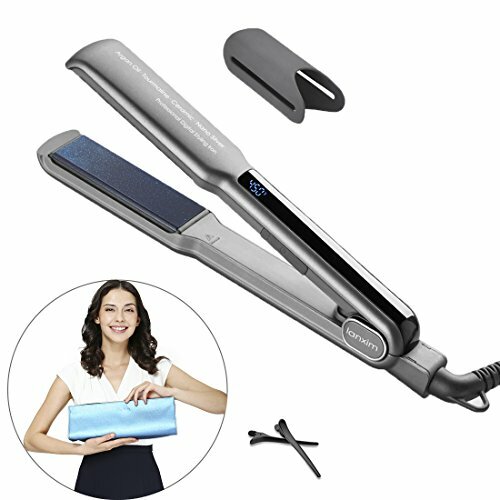 Furthermore, if you continually use the same temperature setting, a temperature memory button automatically sets the flat iron at 390 degrees, preventing the need to scroll through numerous settings. Maintain moisture in hair. This flat iron boasts ceramic heat plates with ionic moisturizing technology. This technology keeps hair moisturized and gives it a silky appearance. Many users with dry hair say they can tell a difference between this flat iron and comparable products. Simple 10 temperature settings. 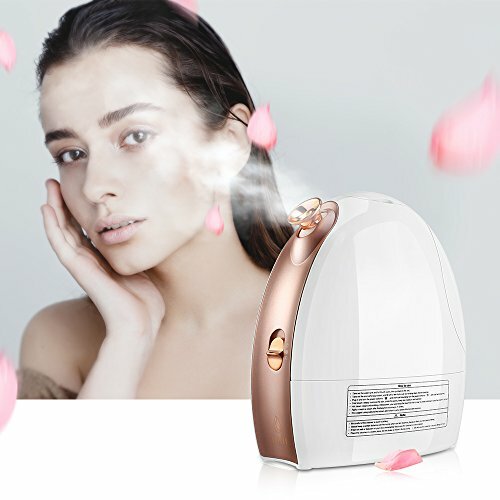 Ten pre-set temperature settings are available on this device, making it easier to choose the right amount of heat for your hair. An LED display clearly displays the temperature you choose and a flashing light will alert you each time the temperature increases 15 degrees. Helpful temperature memory option. This device boasts a small button — identified with an M — that automatically turns the temperature of the product to 390 degrees. This prevents scrolling through numerous temperature settings to reach your desired amount of heat. Pulls and tugs on hair. Many users report this hair straightener is prone to tug and pull on hair, despite its 3D heating plates. You’ll want to be careful and gentle when using this device. Natural hair is often dry and heat can quickly damage it. Flat irons with ceramic plates are ideal for this hair type as they conduct heat well and have minimal hot spots. Additionally, ceramic plates help control hair frizz and smooth hair well. Individuals with natural hair should avoid titanium plates as they can quickly damage and are unforgiving for this hair type. Refresh dry and damaged hair with this keratin-infused flat iron. 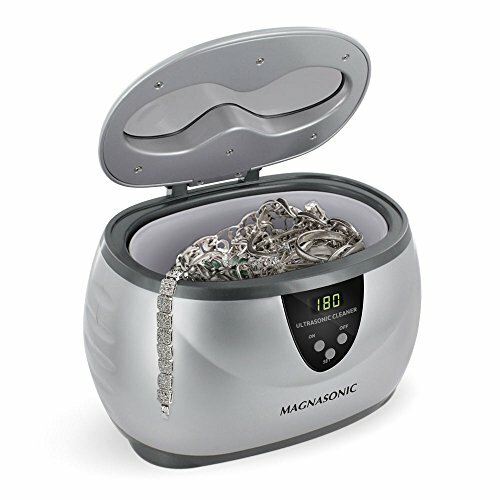 Boasting tourmaline ceramic heat plates, the device keeps moisture in your hair, resulting in healthy, frizz-free hair. This MHU flat iron also features low-temperature settings and a 1.25-inch wide plate, allowing you to straighten thick and thin hair without damaging it. 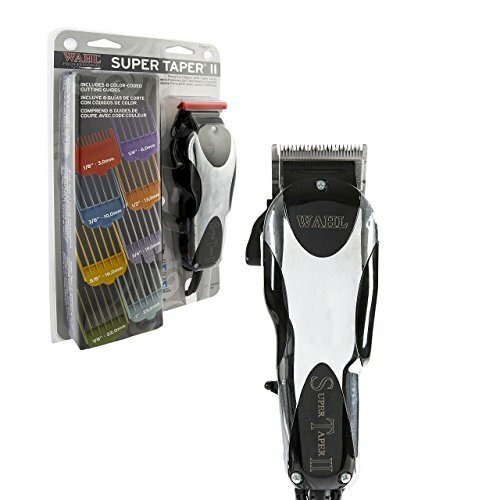 An LCD display screen, swivel cord and automatic shut off capabilities also add to the convenience and simplicity of this hair tool. Prevents excessive dryness and brittle hair. The keratin-infused heat plates help repair and refresh dry and damaged hair. These plates keep your hair moist and won’t strip your hair of moisture and nutrients as similar products may do. Ideal for long or short hair. The heat plates on this device are 1.25-inches wide. This is thick enough that you can straighten large sections of hair at once, yet still narrow so you can reach hairs close to your head and easily maintain shorter hair styles. Simple interface. Many reviewers say this hair straightener is straightforward and simple to use. Four buttons help you navigate throughout the temperature range, power and memory functions on the device. 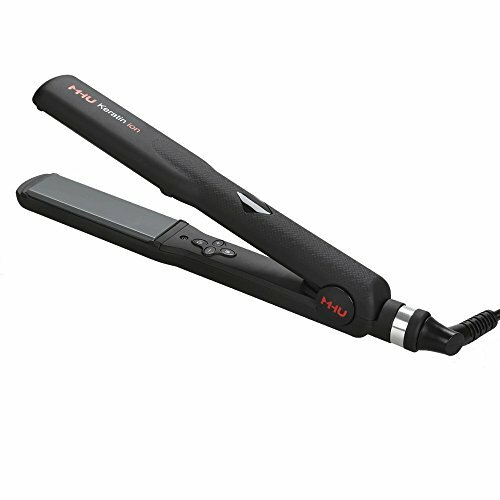 An LCD display screen lets you view the exact temperature of the device and a swivel cord allows you to move the flat iron around without difficulty. Longer heat up time. This flat iron takes approximately 45 seconds to heat up before you can use it. Similar products can reach low temperatures within 15 and 30 seconds. Does not include any accessories. This flat iron does not include a carrying case, hair clips, traveling pouch or any additional accessories. Several comparable products offer a handful of tools to make traveling with and using the flat iron enjoyable and hassle-free. If you have thick hair, you need a product that effectively smooths out large amounts of hair at once. The best flat iron for this hair type features wide plates — typically 1 ½ inches or larger. You also want to consider products that reach temperatures up to 400 degrees or higher as this type of hair is harder to straighten. Titanium plates are ideal for this hair type as they heat up quickly and can hold a high temperature for long periods of time. Many titanium products boast an ionic charge, which helps smooth hair and keeps it healthy while applying high heat. Thick hair can take an ample amount of time to straighten — particularly with the wrong flat iron. This device is the perfect hair tool for thick and coarse hair as it can smooth large sections of hair at once with its large 1.75-inch floating plates. It can reach high temperatures of 450 degrees, providing enough heat to handle even the coarsest hair without damaging it. 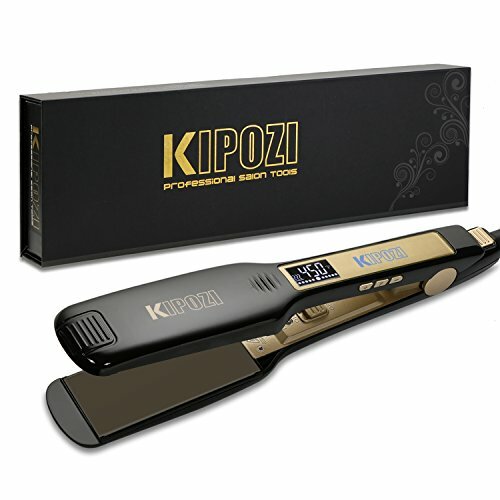 This KIPOZI flat iron’s titanium plates heat up quickly and hold high temperatures for long periods of time. Even more, the user-friendly and durable design of this flat iron is enjoyable to use — particularly for thick hair that takes long periods of time to straighten and smooth. High maximum temperature. This flat iron can reach temperatures up to 450 degrees. This provides plenty of heat to straighten and smooth wavy and coarse hair. Wide 1.75-inch floating plates. 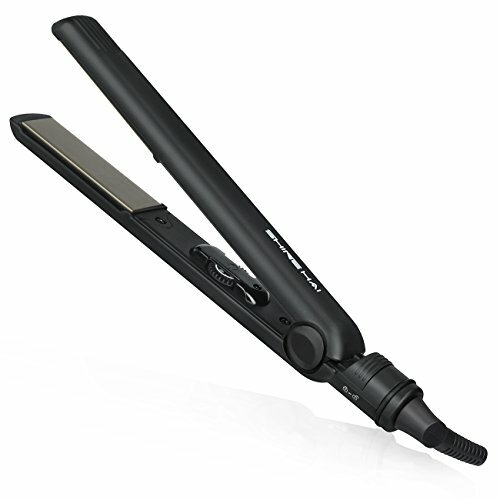 The wide design of the heat plates lets you grab and straighten large sections of hair at once. Many users say the plates don’t pull and tug on hair while straightening it. Numeroud benefits with titanium plates. 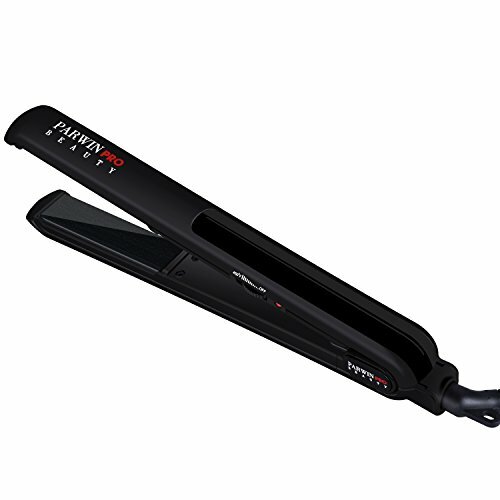 This flat iron boasts titanium heat plates which are ideal for thick and coarse hair. These heat plates can heat up quickly and maintain high temperatures without creating hot spots and damaging small sections of your hair. Many users praise the smooth, sleek appearance these titanium plates offer. Well-constructed and durable. This product is built well and the handle is easy to hold. Furthermore, this product boasts a long 8-foot power cord, giving you plenty of freedom to walk around when doing your hair each day. Not great for curling. This flat iron features wide and square plates, making it difficult to produce curls or waves with this flat iron. A flat iron that reaches and maintains high temperatures is ideal for straightening curly hair. Titanium plates are best as they heat up quickly and can reach up to 450 degrees with ease. The amount of curl your hair contains will determine the size of plates you need. Narrow plates are best for reaching the hair close to your head, which is ideal if you have super curly hair. More wavy and coarse hair will do well with wider plates. If you have delicate hair, you want to avoid flat irons for curly hair as the high heat can be extremely damaging. The ISHAKO Flat Iron is an excellent option if you have long or short curly hair. 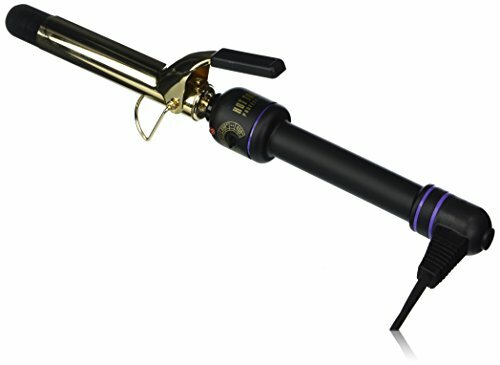 It can reach up to 450 degrees, offering plenty of heat to smooth out even the tightest curls. Its narrow, rounded plate design allow you to add more curl to your hair if necessary and its ergonomic design makes holding this product simple even for an extended time frame. Additionally, this is one of the few straightening irons available that offers multiple color options and lets you add a little pizazz to your hair tools. No need to repeat hair sections. Users with curly, wavy and coarse hair say this flat iron made their hair manageable and they didn't have to continually straighten sections of hair to receive smooth, frizz-free results. Excellent option for multiple hair styles. This flat iron features 1.25-inch wide heat plates that are the ideal size for either long or short hair. The narrow heat plates and rounded edge on this flat iron also allow you to add more curl to your hair if desired. Lightweight, ergonomic design. This flat iron weighs just over one pound, making it easy to hold for extended periods of time. Several reviewers say you can move the device around your head with ease due to the thin handle and non-slip grip. Heats up in less than 30 seconds. After turning on this flat iron, you can use it on the lowest temperature setting within 30 seconds. You won’t have to wait long to start straightening your hair and getting the look you desire. Numerous color options. You don’t have to settle for neutral or boring colors on your hair tools. 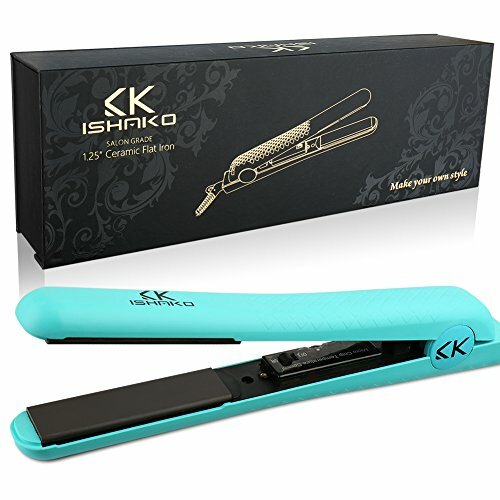 This ISHAKO flat iron is available in bright colors including hot pink, turquoise and purple. Very few flat irons offer color choices and are only available in black. Pulls on hair. Several users report this hair tool pulls and tugs on hair. If you have particularly thick, curly hair, you may experience more pulling than someone with less hair. If you have fine and thin hair, you need to be extremely picky about the type of flat iron you choose. Flat irons with low-temperature settings are ideal — particularly those with temperature control options — so you can ensure the flat iron doesn’t reach high temperatures. Look for products with temperatures 350 degrees and lower. Tourmaline and ceramic plates are excellent options for this hair type as both do well trapping in your hair’s moisture and giving your hair a silky appearance. The PARWIN PRO flat iron is an excellent option if you have short hair and don’t need much heat to straighten and smooth out your hair. Its narrow plates are ideal for straightening bangs or pixie cuts and the 3D floating plates help you get a close grip without pulling and tugging on your hair. This device can reach its maximum 450-degree temperature in less than minute —much faster than comparable products — and it boasts automatic shut off, a 360-degree swivel cord and ceramic plates which aid in helping you achieve the perfect hairdo. Perfect for short hair. This product features very narrow 1.1-inch heat plates. These heat plates are an excellent size to straighten short hair, particularly pixie cuts and bangs. Gets excellent grip on hair. 3D floating hair plates can adjust to get a closer, more accurate grip on your hair. According to many users, this helps straighten hair well and does not tug and pull on hair. Can begin using in seconds. This device will reach its maximum 450-degree temperature within 60 seconds. Many comparable products require that length of time to reach their lowest temperature settings. Doesn’t reach high temperatures. Many users say this flat iron has a difficult time reaching high temperatures. If you plan to share this product with someone who needs high heat, they may have to repeat sections multiple times to fully straighten hair.